I’ve been off the social media grid for the past several months. I’ve been poring all of my energy into a new business startup, which left me little time for non-business related interests. In fact, I hadn’t even read a book for pleasure for nearly four months. If you haven’t had a chance to see the MSNBC documentary Why Planes Crash: Brace for Impact, here’s a very good clip about the ALM ditching. Normally this is the place where I review documentary films, but since I took part in this documentary I don’t want to appear as a self promoter. Having said that, you should definitely see this documentary. The producer, Caroline Sommers, was asked to do a documentary on the Hudson ditching. She decided instead to do a documentary on the subject of ditchings. 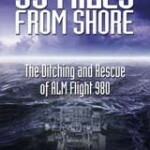 Besides the USAir 1549 ditching, the documentary covers the 1956 ditching of a PanAm Clipper, the 1996 ditching of an Ethiopian Boeing 767 off the coast of Africa, and the ditching I wrote about in my book 35 Miles From Shorethe 1970 ditching of ALM 980. I just got word that the MSNBC documentary on aircraft ditchings will air on July 12 at 10:00 pm EDT on MSNBC. I’ll put up some links as soon as I have more info. 35 Miles From Shore takes Honorable Mention. I will be giving a slide show presentation at the Medina County District Library at 210 south Broadway, Medina, OH this Tuesday, September 30 from 6:30 pm to 8:30 pm. I will be giving a slideshow presentation in Pensacola, Florida at the West Florida Public Library on September 19 starting at 4:30 pm. I’ll be doing a live radio show this Sunday August 24 from 1:00 pm to 2:00 pm EDT. Joining me on the program will be former captain Balset DeWitt and John Barber, who was a crew chief aboard one of the marine helicopters.